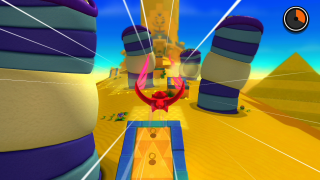 Desert Ruins (デザートルーインズ Dezāto Rūinzu) is the second world of Sonic Lost World, themed after a generic desert with puzzle-filled pyramids and obstacles such as cacti. At the end of the world, Sonic kicks away Dr. Eggman's Cacophonic Conch, causing the scientist to lose control of the Deadly Six. In the 3DS version, the player can gather Yellow Material here. In Zone 1, the player traverses a very open-spaced desert full of quicksand, rolling cacti and giant sandworms, using the Crimson Eagle Color Power to soar over the quicksand. The player will also go through the desert temples, which are vertical climbs full of sandworms that will try to gobble up Sonic. Another feature are streams of sand that send Sonic sliding in a given direction. Zone 2 is an automated running level similar to the "Mach Speed" segments of previous 3D titles, featuring the player running down a highway of honeycombs while destroying chains of Galaga Bees and avoiding Buzzers and Balkiries before ending with a fight against Zomom. Running into any of the walls in this act constitutes an instant death. Another obstacle to watch out for are badniks that will fling honey into the screen, making it harder to see what's going on. Due to the abundance of lives, this Zone is ideal for life-grinding. Zone 3 is an entirely 2.5D place with many sweets, cakes, donuts and ice cream like with Sweet Mountain from Sonic Colors. In fact, the title card also shows "Dessert Ruins", with the second "S" added in as a correction to form a pun. Running along on the liquorice highways, Sonic will encounter Antons that must be defeated with Flying Kicks. Sonic can also jump on truffles fired out of cannons to climb higher. Zone 4 is a slow-moving auto-scroller with a lethal sand tornado that chases Sonic. Halfway through the stage, the player has to use the Yellow Drill Color Power to traverse through the sand, then run from another sand tornado until they fight Zomom again. Zone 1 is set up much like the first Zone of the Wii U/PC version with sand pits, giant sandworms and cacti, and makes heavy use of the Indigo Asteroid Color Power. Near the end of the Zone, a colossal sandworm will chase Sonic relentlessly and must be avoided at all costs. Zone 2, unlike the Wii U version does not have the hive but a labyrinthe pyramid with several challenges such as pressing buttons to open pathways, stunning rolling stone heads, and avoiding Sols. By using the Yellow Drill Color Power, the player can burrow through the sand. Zone 3 is set in a maze of moving sand where the player must defeat sandworms to advance, and further into the Zone, Zomom's Totem Mech will be shooting lasers and wind to stop Sonic. The Gray Quake Color Power also appears here, allowing Sonic to break grey blocks. Desert Ruins was also featured as a special event stage in Sonic Runners for a limited time with its own story. Team Sonic discovers a fragment of the world of the Arabian Nights above their world and decide to search for treasure there. Along the way, they discover that Erazor Djinn has been freed, but got split into a thousand weaker pieces which Dr. Eggman, who has taken King Shahryār's place, is gathering one hundred of to form a super-djinn to take over the world with. Team Sonic employ Eggman's strategy against him to foil his plans and restore Shahryār to the throne. As an event stage, Desert Ruins was suitable for all three types of characters. Desert Ruins is the second stage playable in Sonic Runners Adventure unlike the stage presented in Sonic Runners, which was an event stage. During the hunt for Dr. Eggman, Sonic is injured in the teleportation from Green Hill to Desert Ruins, and Tails tells him to rest. After this, the fox boy talks to the local animals about Eggman, and then finds Eggman's fortress and a horde of badniks to fight. After taking on the fortress, Tails regroups with Sonic and the two chase the doctor. As soon as they get going, a new horde of badniks approach them, which Tails manages to defeat, but Eggman escapes. This level has a similar appearance to Sandopolis from Sonic & Knuckles. Zone 1 bears a resemblance to Mirage Road from Sonic Rush. The concept of an auto-scroller that is employed in Zone 4 was seen as far back as Bridge Zone from Sonic the Hedgehog (8-bit).